The infamous tenant from hell who has been been featured by the Toronto Star for her long string of eviction cases is reportedly at it again. The newspaper became interested in the story in 2012, after hearing from landlord victims. At that time, the paper conducted its own investigation of the woman’s rental history, which revealed she had been evicted at least 6 times. Unfortunately for landlords interested in a prospective tenant’s rental history, eviction information is not easily accessible. Privacy rules prevent disclosure of tenant names even when that tenant has appeared before the Board repeatedly for failing to pay rent or damaging a property. In fact, reporters had to research court documents (a tenant’s name may appear in appeals), and conduct interviews with landlords, lawyers and paralegals, before they were able to discover that this same tenant was evicted by multiple landlords. Cases like this prompted harsh criticism from an Ontario Superior Court Justice who urged lawmakers and adjudicators to change the rules that allow tenants to manipulate the system of justice and score free rent. This tenant’s photo appeared in the news, along with a request from police that additional victims call in their tips to Crime Stoppers. The investigation revealed that the tenant uses similar tactics each time to obtain rental housing. She’s personable. She targets homes that need repairs, and offers to fix up the place for the owner. Once she’s accepted, she fails to pay. She is accused of providing false information on the rental application. When she gets dragged before the Board, she has complained about the condition of the property and alleged discrimination. According to the recent report, the latest victim is a professional real estate agent. Landlords can’t afford to underestimate the skill of professional tenants like this. These individuals are far more experienced in the eviction process then the typical rental property owner. Tenants like this are out there, and could be trying to get into your rental. All this adds up to one undeniable fact: the only way to rent safely is to run a tenant background check that includes a credit report. Eventually, bad payment history and judgements will show up on a tenant’s credit report. For example, in this case, the tenant has been charged with fraud for providing false employment information on a rental application, and for passing bad cheques. In addition, she is subject to small claims proceedings, according to reports. Bad tenants will peruse rental ads looking for an easy target. By advertising that you will require a tenant background check, you may discourage the professional tenant from applying. There are always easier marks. 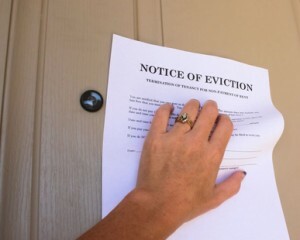 It’s true that eviction takes a long time, and frustrated landlords may try to work it out without the help of the Board. But the best tactic is to file your eviction paperwork at the first sign of trouble. You can always negotiate from there, but in the meantime, your case will be moving up the queue, just in case you need to be there in the end. After many years of being a landlord and even representing the Ontario landlord’s association at queens park and in the media, I have reached the following conclusion: no polictical party (including the conservatives) want to revamp the residential tenancies act to balance rights for landlords. Firstly there is no political gain for them to do so, secondly Ontario’s govt NEEDS the housing rules to be in favor of tenants. This inequality allows them to download hard to house (higher risk) tenants on to private landlords. This keeps these tenants off the provincial housing waiting lists. On top of this challenge, the Ontario human rights commission’s housing policy now requires that private landlords must accommodate (to the point of financial hardship) a tenant’s physical and emotional needs; few landlords are aware of this responsibility. I’m still owed $7000 in unpaid rent from an evicted tenant, and the legislation provides no mechanism to collect from someone who has no assets. Her monthly welfare cheque continues to go to her when most of it is provided for rent payment. I neglected to follow my doubts from her bad credit check from TVS, and took pity on her situation, leaving me with nothing.